Neuroscience is a fast developing area of research which in recent years has been moving into areas of direct relevance to psychotherapists. These include insights into the nature of the relationship between psyche and soma, the place of evolutionarily endowed biological affective systems in emotional life and the importance of prosody in communicating affective states. Dr Mizen spoke about neuroscience developments of direct relevance to psychotherapists and described the ways in which coming to understand more about neuroscience has brought new ideas about therapeutic work with people with complex difficulties. Dr Mizen is a Consultant Medical Psychotherapist and SAP Jungian Analyst. She trained at the Cassel Hospital in West London before becoming a Consultant at Charing Cross Hospital Fulham. She wrote the business case for and until recently led the Devon Partnership Trust Specialist Personality Disorder Service. She is developing a neuroscientific psychotherapeutic Relational Affective Model, for teams working with people with severe and complex Personality Disorder. She is interested in the interface between neuroscience and psychoanalysis and is undertaking a PhD in Neuroscience. 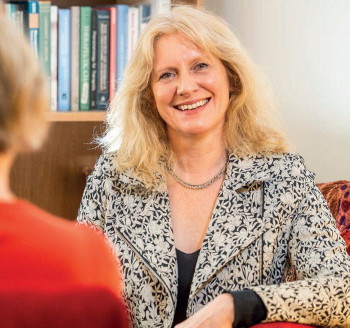 She was Chair of the Medical Psychotherapy Faculty at the Royal College of Psychiatrists between 2014 and 2018 and is Chair of the Talking Therapies Task Force.